Easy to use, it doesn’t need trained people, it guarantees the ideal temperature and can be moved from one vehicle to another. With U-Go! 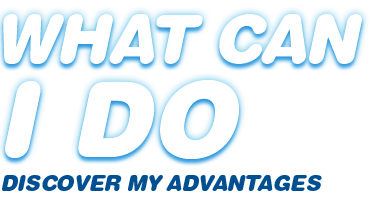 you can ‘be cool’ anywhere you go! 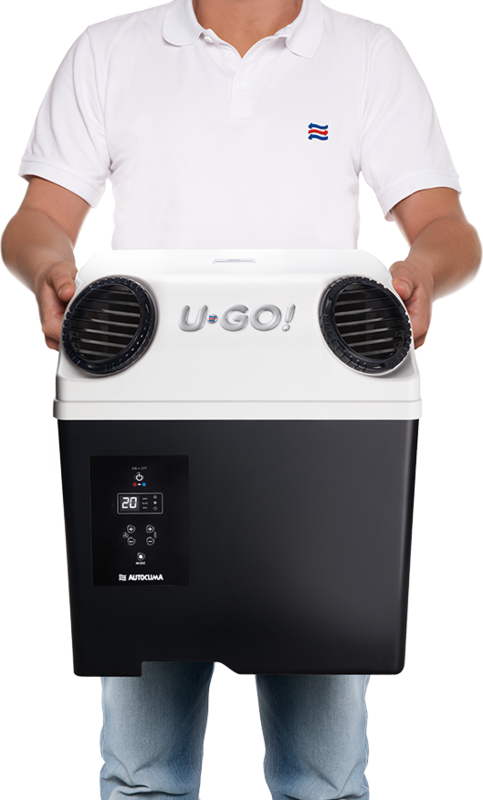 I am the first portable parking cooler, the latest newcomer in the ‘Fresco’ line from Autoclima. 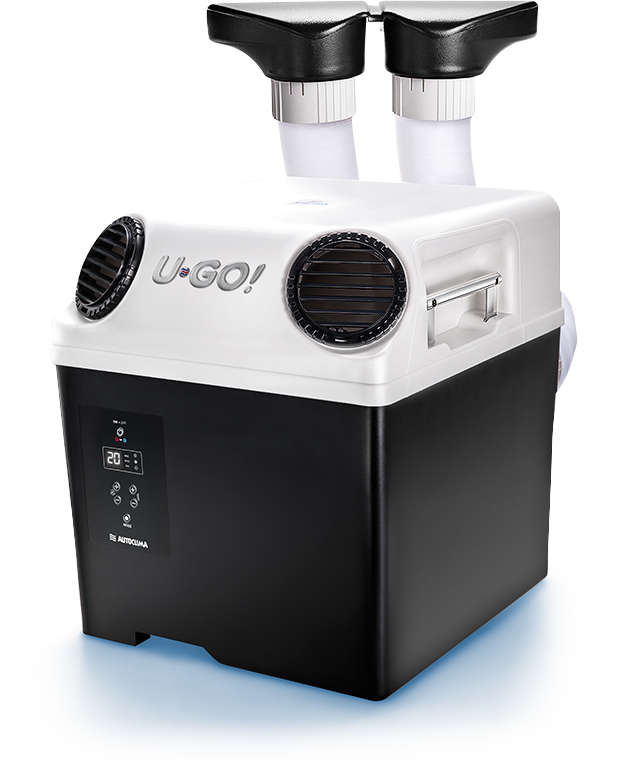 A trusty companion, designed to guarantee the best temperature, cooling down and heating up your cabin. I can be placed anywhere, and thank to my low weight, you will be able to bring me with you, carrying me from one vehicle to another. I operate only by recirculating air, so there are no risks of aggression with sleeping gas through the air louvers. Installing the snorkel with the special gasket does not ease breaking and entering the vehicle in any way. I am equipped with a battery-saver, so I’ll never drain your battery dry. Thanks to me it’s possible for you to rest inside the cabin with the windows closed, avoiding those pesky insects, smoke and noise from the outside. Don’t forget, while driving, to secure me with the seat belt (either the vehicle’s or the one included with me) or with some other securing device. I operate when the engine is off: so I reduce fuel consumption and therefore I work to the benefit of the environment since I limit pollution. Also, since I do not change the vehicle’s CX, this means that when I’m with you, you are saving fuel. Maintenance is almost zero and the amount of R134a refrigerant is limited. I may not be as recyclable as the vehicle on which you travel, but I’m certainly REUSABLE. I weigh 19.5 kg and I am rather small: 36x37x40 cm. Thanks to two handles and a sling, you can move me and place me anywhere, on any vehicle. 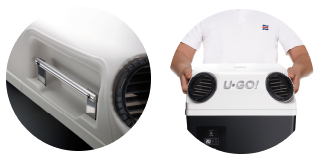 Even though I am so compact, I have the same technical, technological and quality characteristics featured in any parking air conditioner by Autoclima. 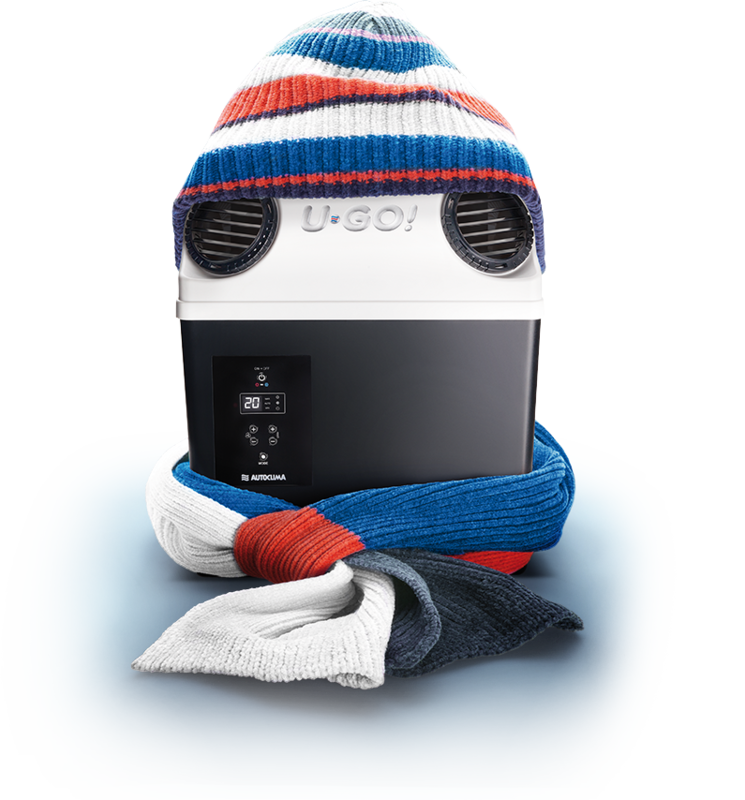 I am a true air conditioner able to cool, heat and dehumidify. I even have a heating function to mitigate first cold weathers. Thanks to a smart management panel, I can automatically adjust the speed of my fans, the temperature and the compressor, improving your comfort and controlling power consumption. I am equipped with a remote control and, with all my extra accessories, you can set me to cool down only a desired area. With the timer you can also set my operating time, based on your travel plan. I’m directly powered by the vehicle’s battery: I can be connected to a 22 A power outlet minimum, if it is installed on the vehicle, otherwise you can use the included wiring. I can be easily placed and moved within the cabin: on the top or bottom sleeping bed, on the passenger seat or in the space intended for the seat, in the passenger’s foot well, between the seats, on the dashboard, in the locker. My snorkel can be placed on the window or in the hatch and there are no installation costs: it is not necessary to modify the cabin with holes for the refrigerant hoses crossing and I do not prevent the use of the hatch.